I love the design of the new Volkswagen Beetle! It kind of reminds me of the old Karmann Ghias. I totally want one. Eventually. 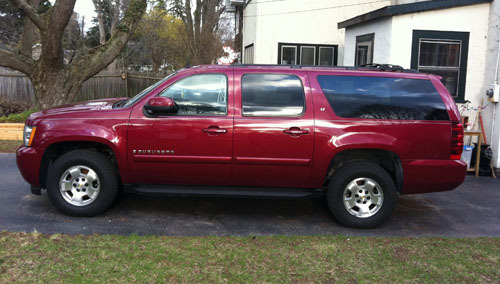 I won't be looking for a new car for awhile 'cause we just got a new-to-us Suburban. We traded my Mini Cooper and Aaron's truck in on the Suburban. You might think that it's not very green for someone that also has a Smart Car to get such a big SUV but actually the Suburban is Flex Fuel. It can run on either gas or E85. E85 is made from corn which is a renewable resource and burns cleaner than gasoline. It might not be the perfect solution but it's getting there. Hey! It's actually Karmann Ghia - the Karmann part was a German company and the Ghia parts was an Italian company. VW partnered with them for the design & build of the car. I admit a soft spot for them - I was always jealous of Molly Ringwald's K-G in Pretty in Pink. But even on the E85, does it get good gas mileage? And how many places is E85 available? It doesn't get 43 like the Smart Car, more like 16 to 19, but you see we don't drive it every day. We only drive it on long trips or when we need to haul something. Aaron and I car pool to work. There is an E85 pump right downtown. Plus you can mix gas and E85 if you are out and you are running low.